Russian physician; born at Wilna 1837; died at Kiev Sept. 22, 1896; graduated from the University of St. Vladimir, Kiev, in 1865. He remained at the same university as a stipendiary to prepare for a professorship, but in 1867 was appointed city physician at Yalutorovsk, government of Tobolsk, and shortly afterward transferred as county physician to Nezhin. In 1873 he was appointed chief physician of the Nezhin Hospital and physician of the Lyceum of Prince Bezborodko. In 1879 he gave up his position in order to devote himself entirely to science. 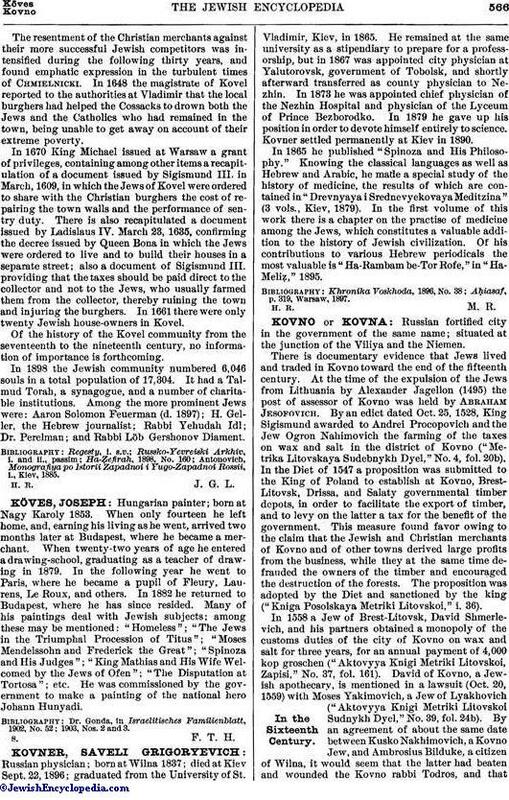 Kovner settled permanently at Kiev in 1890. In 1865 he published "Spinoza and His Philosophy." Knowing the classical languages as well as Hebrew and Arabic, he made a special study of the history of medicine, the results of which are contained in "Drevnyaya i Srednevyekovaya Meditzina" (3 vols., Kiev, 1879). In the first volume of this work there is a chapter on the practise of medicine among the Jews, which constitutes a valuable addition to the history of Jewish civilization. Of his contributions to various Hebrew periodicals the most valuable is "Ha-Rambam be-Tor Rofe," in "Ha-Meliẓ," 1895. Aḥiasaf, p. 319, Warsaw, 1897.